The good thing about prefabricated homes is that they can be sized up or down as you wish. So if you fall in love with the look and feel of a particular model that doesn’t quite tick all the boxes, there is almost always room to tweak the design. You can even configure the design to suit all your specifications right down to the inch AND get a watertight costing of the project before construction even starts. The façade of the home is dominated by the rather steeply sloping roof. This gives the rather modest home a bold look and makes it appear deceivingly expansive. The deep eaves also provide some shade and have a significant effect on the amount of heat the home absorbs. 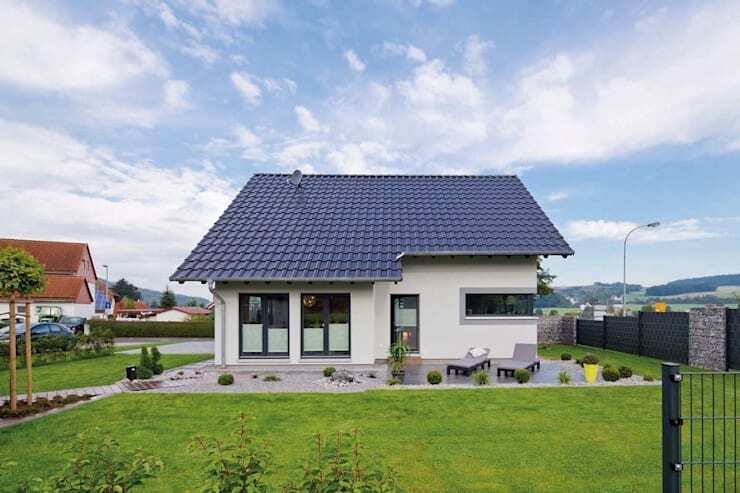 Finally, a steeply sloping roof on two sides like this is perfect for solar panels. Most people want a modern home that will have a good connection with the outdoors. This one has two full-length French doors that open out onto a small patio or outdoor entertaining area. It also has a very slick corner window that adds an undeniably contemporary touch. And yet, the exterior as a whole has a quite classic appearance. This is largely due to the classic pitched roof. The entrance area is compact, yet stylish. 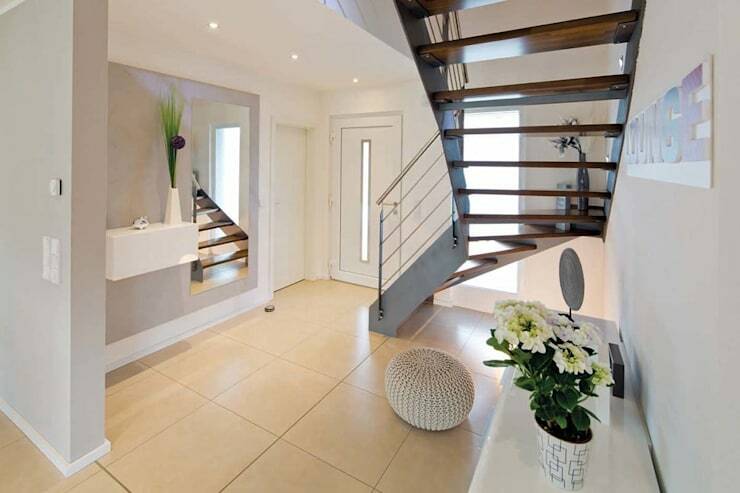 There is a two directional staircase that bends at a sharp turn for a very modern look. Entrance areas often need a little extra touch to feel homely and welcoming. But this one is so perfectly realized, that the simple basics might be more than enough. Note how the wide doorway makes the area feel expansive and comfortable. 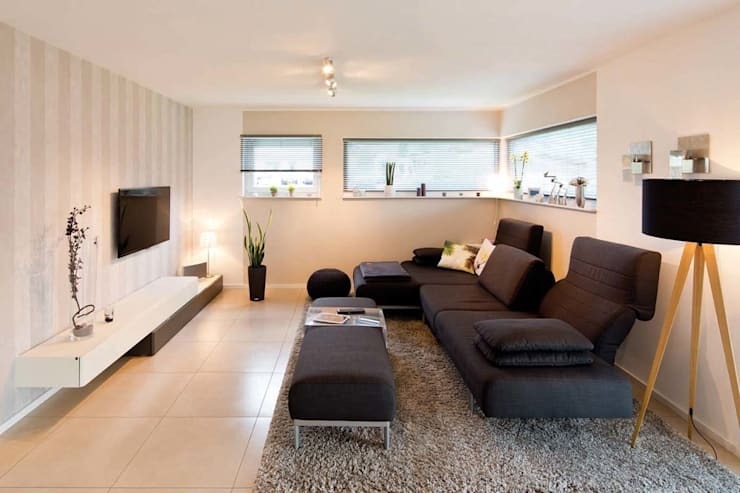 The living room has been designed to perfectly fit a large corner sofa. The high-set corner windows also allow for lots of light, while keeping the walls fairly free for closely arranged furniture. It is a modestly sized living room, but this is hardly a problem. In fact, the very size of the room makes it particularly cosy. It’s the perfect place to hide away and hunker down for a movie marathon. The dining room is located near the French doors and outdoor entertaining area. 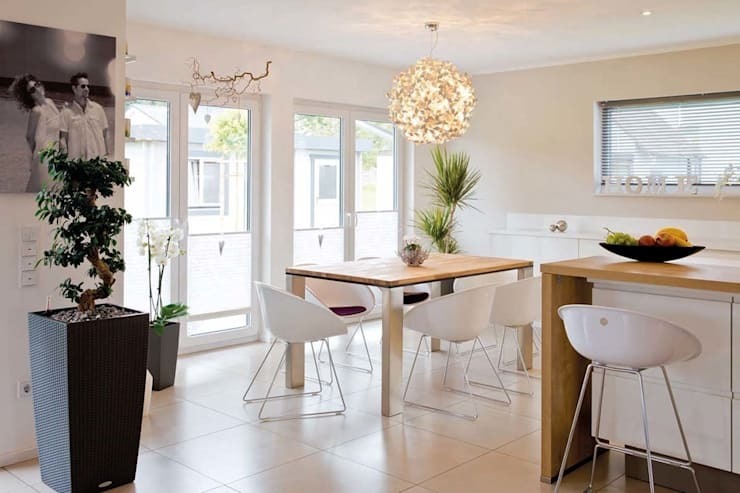 Its’ close proximity to the kitchen makes for an easy sociable cooking and dining experience. While this is a home with some integrated open-plan living spaces, there layout and orientation of each room makes for a natural separation of the various zones within the home. Prefabricated or modular homes are incredibly cost-efficient, so you may choose to splurge a little on the bathroom. 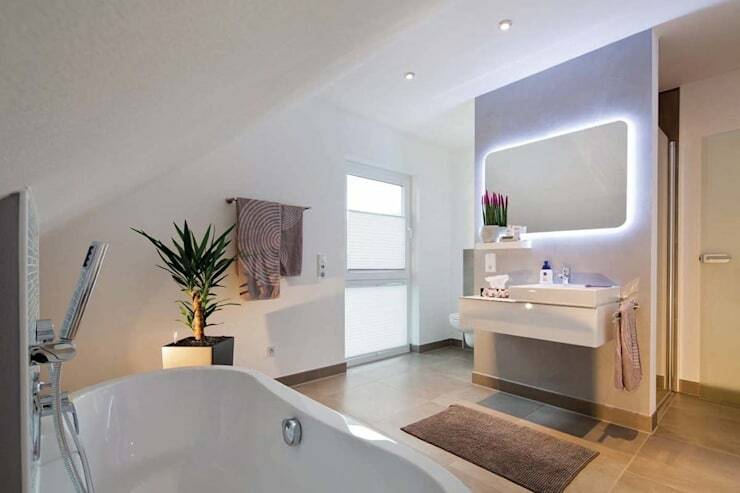 This home design has a sloping roof that creates the perfect little space for a cosy bathtub area. That low roof height is hardly a problem in the corner of the room. For more architectural inspiration, check out 6 budget-friendly wooden houses you'll love. 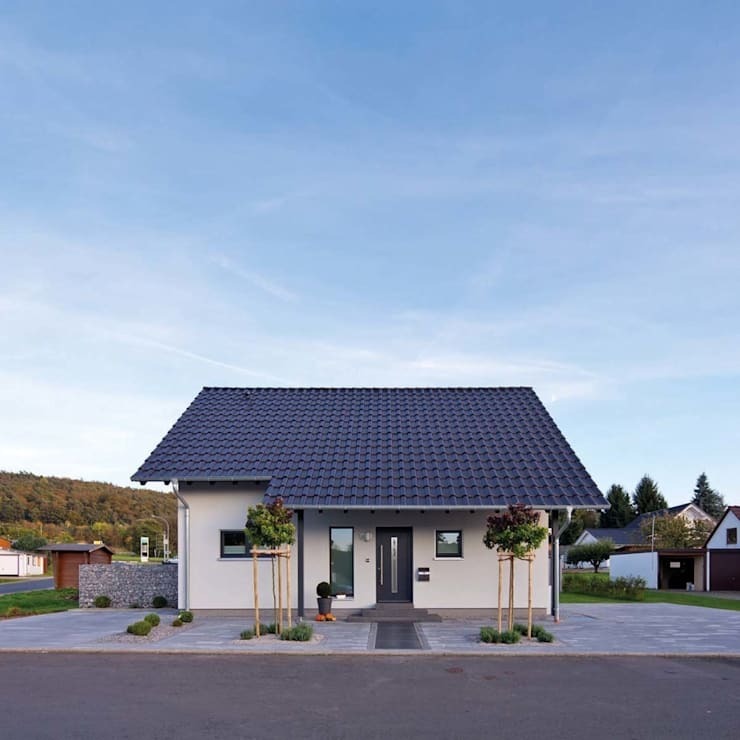 What do you think of the roof on this home?